You would never guess by looking at these Christmas family photos that it was raining like crazy all day. We were forced into the barn for portraits and boy am I glad, because these are some of my favorite large family pictures EVER! There outfits couldn’t have been anymore perfect for the barn setting. I photographed the Wissman family last year around Thanksgiving. It seemed like little Stella was just a baby compared to this year, all the boys are a foot taller, and Valerie is becoming such a beautiful young lady:). We weren’t able to get their hockey shots last year, but this time around we made sure to include some pictures of the boys in their hockey gear. This is a fun, rambunctious group and I’m honored that they came back this year for another round of family portraits! Thank You. Here are some of my favorite pictures from the session. 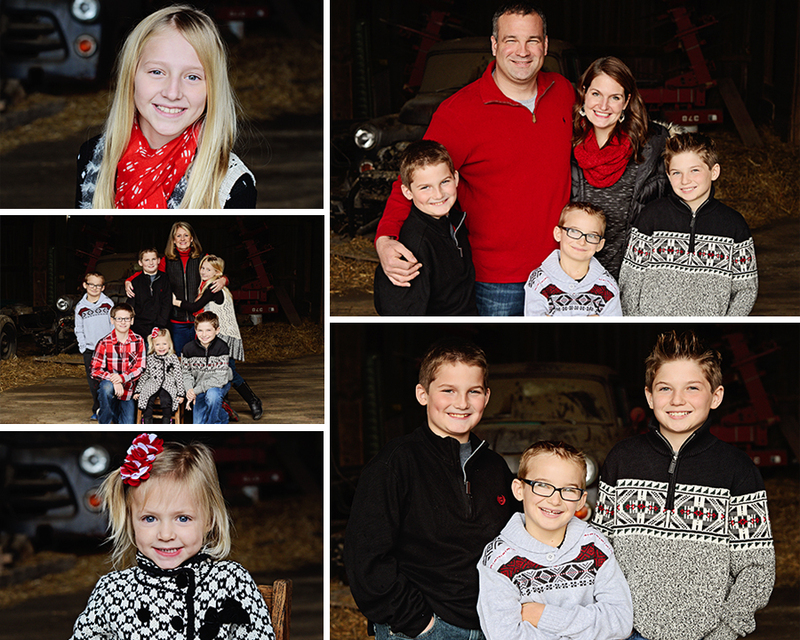 To take a look at the entire beautiful family portraits session shot in the barn click here.